Do you know that 34% managers of IT are highly active on the platform of LinkedIn? They prefer updating the statuses at least once a week and make required changes. This really shows the higher interest of managers to get enormous success in professional career anytime in the future. The review is written by our best LinkedIn profile writers and primarily based on LinkedIn’s All-Star level of completion. Your profile is currently missing several key completion elements. The profile picture and headline are the two most frequently viewed aspects of your profile. Without a profile picture, you are less likely to have your profile viewed by recruiters and future employers. Consider updating your headline to show your experience and what of job you are seeking. Including a headline, such as ‘Experienced Information Technology Manager Seeking Position’ will help your profile stand out from the crowd. 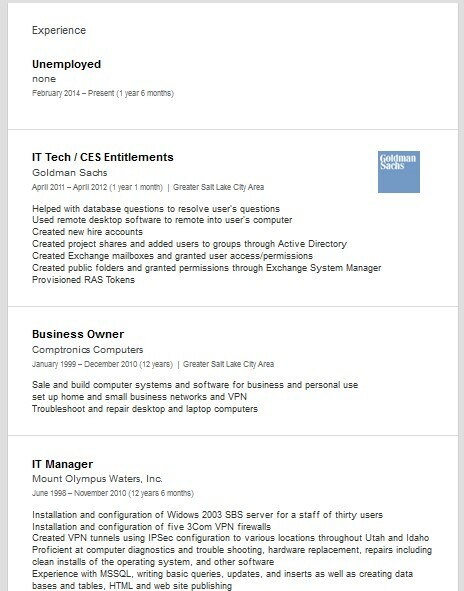 LinkedIn allows you to have 50 skills listed in your skills section. Make sure that the skills and endorsements listed on your profile accurately display your skills. The skills most related the position that you are seeking should be at the top of this section. Adding at least 6 more connections will increase the number of opportunities that an interested recruiter or future employer will look at your profile. You might be also interested in our technical support Linkedin profile review. It’s never too late to make the connections. As a manager of IT, you are supposed to make as many connections as you can. Try to share the most relevant content. Nobody is free enough to read long useless stories on your profile. Another best way is related to content’s publishing. When you will post the personal blogs, try to make them interesting yet unique. Never forget to have the customized URL of your profile. It is an ideal way to make the access of your profile easier. Why do you feel shy to introduce yourself in the right manner? Use this platform properly to get innumerable benefits. You won’t be able to get bets results without showing the higher influence of media on your profile. Make YouTube videos and create the personal blog. Simply, use a professional photo for a profile that should definitely not from your recent hang out with buddies i.e. Facebook or Instagram pictures. Understand the word ‘Professional’ here. Never take the nature of content less serious. The grammatical mistakes are not tolerated at all. Similarly, no spelling mistakes should be made. Proofread the content as much as you can. Stop filling up your profile by using buzzwords. Employers are not interested to hear your good things by yourself. This is nothing but sarcasm. The managers in the field of IT have to consider many things to get this job. The very first suggestion you need to pay attention to is making the content worth to read. The more time you will spend in writing eye-grabbing content, the more you will be able to get best job offers. Never do it all in hurry. Creating and making a good profile of LinkedIn requires adequate time. Spend a day in each section. This would be helpful to create a quintessential final output. 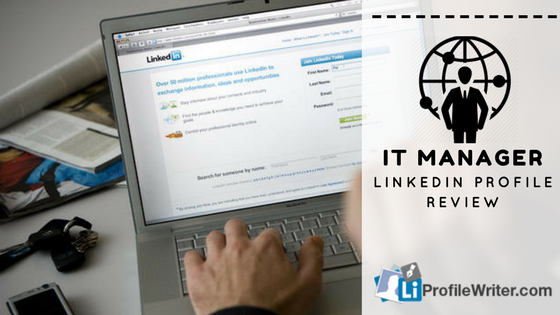 You are not supposed to review the linked in’s profile without reading the content in detail. Giving a thorough read is definitely important to make useful changes in the profile. Check the LinkedIn page of your firm to see whether they have made any updates or not. You also have to make such changes for sure. Fix all the grammatical and spelling mistakes straight away. Remove all the long yet irrelevant/unnecessary sentences. It is better to use keywords instead to make your online presence easier for others. Check the well-established profiles of other IT managers. You can get lots of guidance by seeing their profiles.